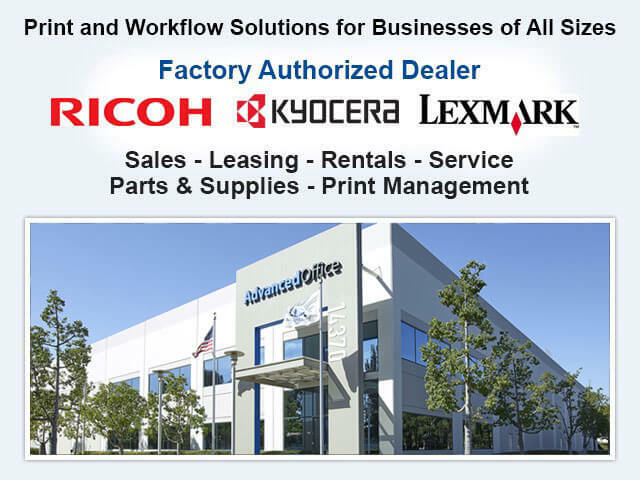 Advanced Office is a full-service, independent authorized dealer for Ricoh and Lexmark. 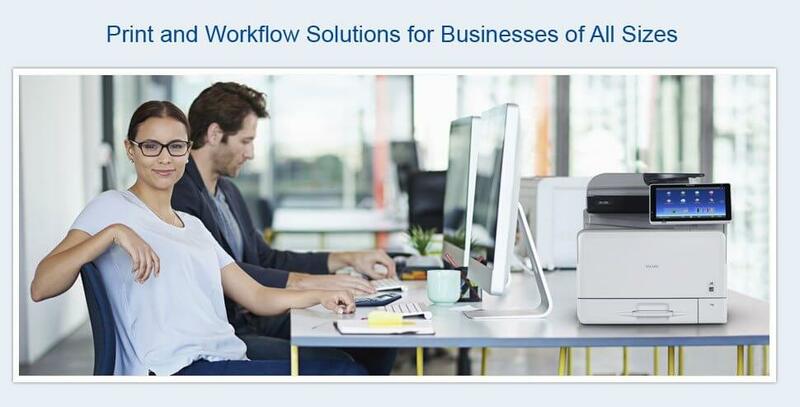 We specialize in providing innovative, customized workflow solutions that improve productivity, reduce inefficiencies, and lower printing costs in businesses of every size. We have tens of thousands of satisfied clients throughout Southern California, and a good portion of them are from right here in Glendale. Our solutions include expert product recommendations; competitively priced sales, leasing and rental options for high-performance copiers and printers; print management software; cost-effective service and supply agreements; refurbished copiers; and more. We have more than three decades of experience serving the Glendale business community and a reputation for superior service. Call today to find out how we can help your business become more efficient. 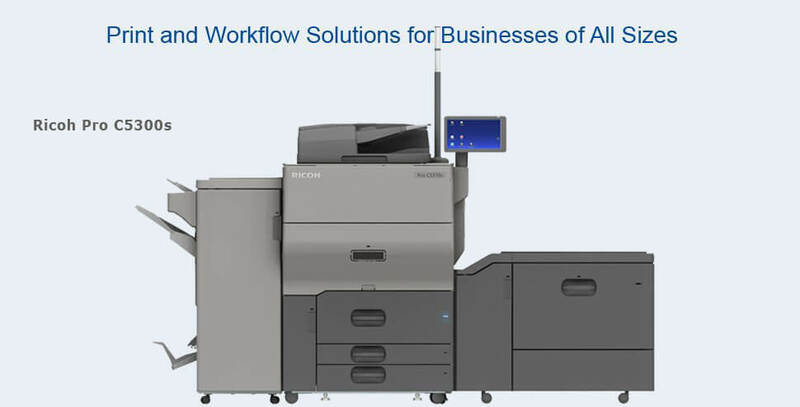 We offer comprehensive print and workflow solutions that are tailored to the needs and budget of each client. We sell, lease, rent and service/maintain multifunction copiers, printers, production printers, wide-format systems, digital duplicators and fax machines. All of our technicians are manufacturer-trained and -certified, insured, and background checked. We're a member of the National Business Technology Association and its Select Dealer Group. Need more reasons? Call us today to schedule your free onsite workflow analysis. You'll meet with one of our printer and copier consultants who will provide you with innovative, comprehensive solutions; expert product recommendations; competitive rates; and friendly, reliable customer service. With all that we have to offer, it's no wonder that we are considered Glendale's best value for commercial copiers and printers. At Advanced Office, we sell, lease and rent the world's finest copiers, printers, production printers, digital duplicators, wide-format systems and fax machines to our clients in Glendale. Our selection of office technology comes from two of the industry's leading manufacturers: Lexmark and Ricoh. Lexmark excels when it comes to industry-specific office automation solutions. Their focus on specialized technology has made Lexmark the preferred choice among 75% of the world's top pharmacies, banks, and retailers. On a smaller scale, Glendale businesses appreciate Lexmark's distinctive A4 machines. These machines offer unparalleled speed for their small footprint and competitive price. Additionally, Lexmark integrates eco-friendly green modes and comprehensive security features on all of their models. 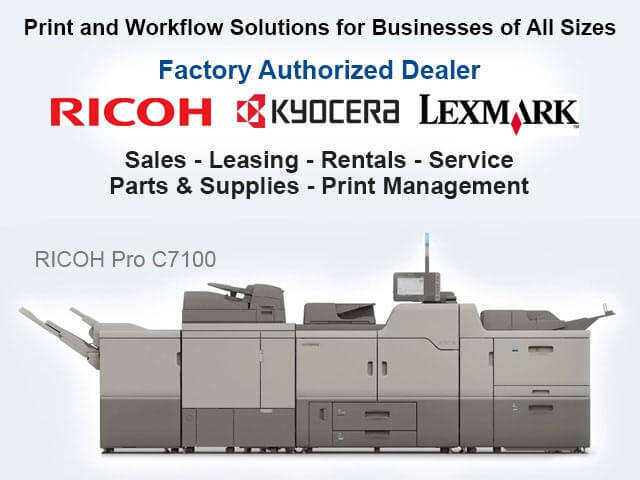 Ricoh is a globally recognized leader in quality, reliability and innovation for office automation products, such as copiers, printers, digital duplicators, wide-format printers, production printers and fax machines. They are currently the leading market shareholder in the United States for office technology products. Moreover, Ricoh's products account for nearly a quarter of all office technology products sold worldwide. Ricoh has also received numerous awards, including outstanding product awards from BLI (Buyers Laboratory), the prestigious Deming Prize for contributions to the advancement of quality, a place among the "Global 100 Most Sustainable Corporations," and a designation as one of the "World's Most Ethical Companies" from The Ethisphere Institute. Since 1977, Advanced Office has helped more than 30,000 clients across Southern California discover the benefits of these two incredible brands. 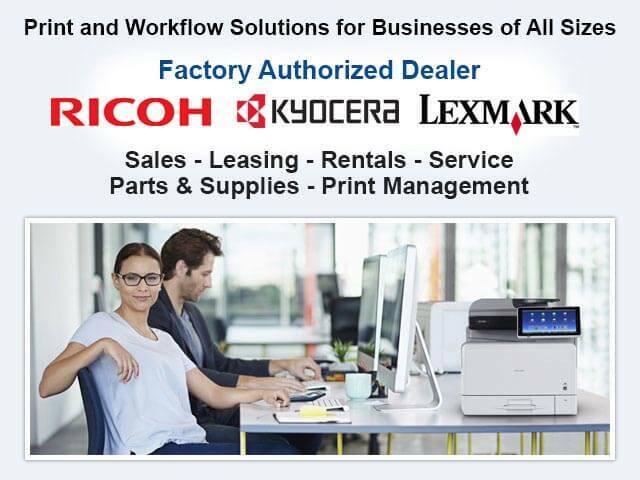 By providing personalized product recommendations and comprehensive workflow solutions that are tailored to the needs of each client at a cost-effective price, we've been able to help companies in Glendale save money and increase productivity while earning ourselves a place among Ricoh and Lexmark's top-ranked dealers. In fact, we are ranked first among Ricoh's Western Region dealers and have reached Lexmark's highest level of dealership as an Authorized Lexmark Business Solutions Dealer. With these impressive achievements, we are able to provide our Glendale clients with the best possible prices, access to exclusive product models, better trained technicians, and faster service. To learn more, call and speak with a live Advanced Office representative today. Leasing often makes it possible for companies in Glendale to enjoy greater tax breaks, stay up-to-date on technology; and afford the precise copier or printer (or fleet of copiers and printers) that they need to run their business. At Advanced Office, we offer Glendale flexible leasing options at low rates for Ricoh and Lexmark's diverse line of high-performance copiers, printers, production printers, digital duplicators, wide-format printers and fax machines. Leases are most commonly issued for three, four and five year terms, but can also be written for another specified term when required. Additionally, every copier and printer lease can also include our cost-effective service and supply agreements as well as any of our custom software solutions. Call now to have one of our copier and printer consultants meet you on site or to speak with a leasing advisor. Advanced Office brings over 30 years of experience in copier and printer sales and an excellent reputation for honest, expert advice to our Glendale customers, which means that we know how to help our clients obtain the best return on their copier or printer investment. We're authorized dealers for Ricoh and Lexmark and we have one of the most highly experienced and trained staff in Southern California. Our copier and printer sales consultants are prepared to accurately assess your unique circumstances and narrow down our broad selection of Ricoh and Lexmark copiers, multifunction devices, single function printers, wide-format systems, production printers, digital duplicators and fax machines until you have a short list of products to choose from that meet your specific needs and budget. If you decide to purchase your new copier, printer or other related office technology from us, you can trust that you'll get a great price and have your equipment delivered and installed faster than you would if you worked with any of our competitors. In addition, you'll gain access to our premium service and supply agreements, onsite product education, and more. 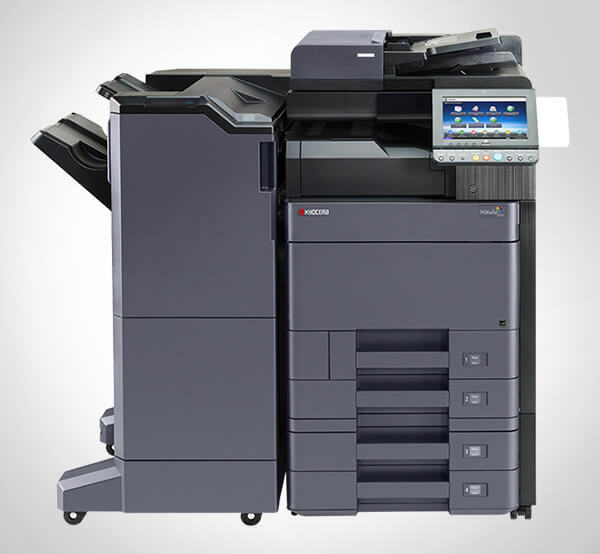 Advanced Office is Glendale's best source for refurbished Ricoh and Lexmark copiers. Our refurbished Ricoh and Lexmark copiers come off of our shortest leases and rentals and are hand selected based their condition and level of usage. Our highly trained technicians then strip and clean them and replace any high-wear components with all new OEM parts until they are restored to like-new condition. We then conduct a 60-point inspection before certifying them for resale. Although lightly used at one point, our refurbished copiers offer the best value in multifunctional devices. Not only will a refurbished Lexmark or Ricoh copier cost much less than their completely new counterparts, but they will still provide you with the same degree of quality, dependability and functionality. We are so confident in our refurbished copiers that this inventory qualifies for our all-inclusive service and supply maintenance agreements. If you want to learn more, call today. Refurbished copiers are always in high demand among our Glendale clients. Advanced Office provides affordable copier and printer rental options to businesses in Glendale. Our rental inventory is constantly changing, but generally includes a wide assortment of high-quality Ricoh and Lexmark copiers, printers and related equipment. Because we understand that copier and printer rentals are typically needed by companies that need a short-term, quick fix while their in-house copier or printer is under repair and those that need a copier or printer for a term that is less than our standard leasing period (often less than two years), we make it a priority to offer very competitive rates and fast delivery and installation. Call us today for a free estimate on a copier or printer rental in Glendale. Advanced Office's cost-effective, all-inclusive service and supply agreements for our Ricoh and Lexmark copiers and printers offer Glendale businesses a wide variety of advantages. This level of coverage includes all parts and labor for urgent repairs and routine maintenance, free onsite product training, and all printer supplies except paper and staples. Additionally, our clients benefit from unbeatable service, maintenance and repairs provided by factory-trained and -certified service technicians, facilitated by a local dispatch, fully stocked vehicles, and a centrally located warehouse with over $1 million in parts. As a result, we are able to guarantee a four-hour average response time. Anytime you experience a problem, you can count on Advanced Office to get printer or copier back up and running faster than any of our competitors. And, if a repair is expected to take longer than you can allow, we can have a rental or replacement promptly delivered and installed to your Glendale site to minimize costly downtime. Call today to learn more about our copier and printer service agreements. In addition to all-inclusive service and supply agreements, we also offer standard parts and labor agreements which don't include toner and other supplies.